Big Generator take a different approach to almost everything they do, The video on the left is just an example of this. Instead of the standard "shoot the band in their best clothes with no crowd approach" the band decided to shoot and edit an honest video themselves to show what actually happens when Big Generator play a wedding. For those who might not be familier with Big Generator here's a quick recap. Big Generator have been considered the benchmark on how a band should sound and perform live for over 20 years, doing thousands of gigs in a total of 10 countries including United Arab Emirates, USA, Holland, Germany, England, Sweden and beyond, several successful chart singles and record deals to playing some of the worlds most famous venues such as Arlene's Grocery lower east side Manhatten, London's infamous Marquee club and of course Dublins 02 Arena. Here are just five of the many shots taken on the trusty iphone from the stage at a few recent weddings, it give you a look at what we get to see !! Big Generator offer the option of band only or band and DJ which covers roughly around 2.5 to 4.5 hours of entertainment (depending on package) until the official licenced closing time. The band and DJ option allows for a seamless changeover between band and DJ almost mixing the first note of the DJ set with the final note from the band so no stopping the party. Sometimes people prefer to book a local DJ or friend but fail to take into account that most DJ's don't usually tend to carry the same size or quality of PA as Big Generator tour with and what happens is that the people on the dancefloor become accustomed to the high definition sound and power of the band and then when the DJ starts it can sometimes become and anti climax. so try and take this into account when deciding on the best package for your special day. Big Generator are very proud of the fact that they were the first band in Ireland to take delivery of one of the new state of the art Fohhn PA Systems which can now be heard in many different clubs, stadiums and arenas throughout the world making the sound quality and definition heard from Big Generator second to none. We always like to recieve feedback via email, text or social media and we like to (as per our video) show it to the public in order to be as honest and transparent as possible. 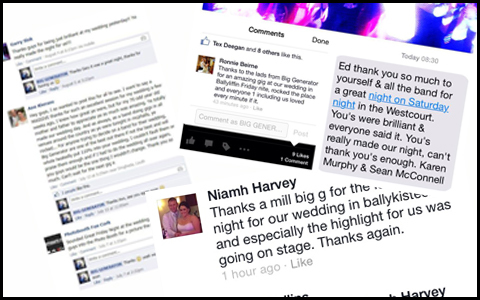 Big Generator like to make it as hassle free for couples when booking us for your wedding, so please feel free to ask us any questions you might have (no matter how small) by emailing info@biggenerator.ie calling 0876358596 or by using the contact form on our contacts page. In the Corporate world Big Generator have for years been the go to band to be asked to perform at many events from company christmas parties, summer BBQ's and many other bizarre ideas some companies come up with.